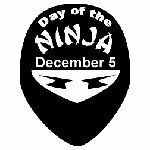 Day of the Ninja is a jolly and unusual holiday, that is celebrated on December 5. This holiday was created in 2003 by a parody website Ninja Burger as a day, when everyone can dress up and act as a real ninja. The date of the holiday was chosen December 5 to mark the release of Tom Cruise's film The Last Samurai. There was a scene where samurai battled ninja, however the theme of the holiday shifted towards the conflict Pirates vs. Ninja, and Day of the Ninja became a counterpart to International Talk Like a Pirate Day on September 19. The first celebration of Day of the Ninja didn't attract much attention, but the next year it was supported by a group from France, who staged elaborate ninja poses in front of the French landmarks, thus the event received a coverage from the media. Do you have an idea how to celebrate the holiday? Today you may make your dream come true and become a real ninja and even act like a ninja. Dress up like ancient Japanese shinobi warriors or do something ninja-like. Also share the information about celebration of Day of the Ninja with your friends. The more, the better and the merrier!